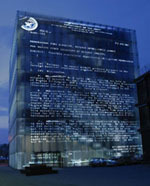 Xenon for Bregenz, image © 2004 Jenny Holzer, courtesy ARS, NY. 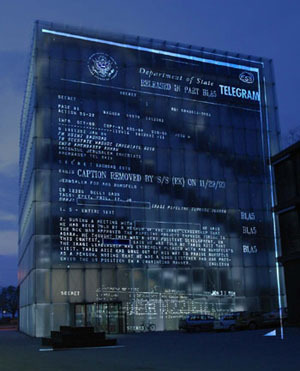 Washington D.C., June 17, 2004 - Noted modern artist Jenny Holzer, whose signature "xenon" film projectors have cast monumental light images of texts and truisms on the sides of buildings and landscapes from Florence to Buenos Aires, features the National Security Archive's declassified documents in her latest exhibition, which opened on June 11 in Bregenz, Austria, through September 5. Holzer's texts for the Bregenz show, titled "Truth Before Power," include more than 30 former secrets obtained by the National Security Archive through the Freedom of Information Act (primarily on U.S. foreign policy in the Middle East, especially Iraq), as well as an essay by the Archive's director, Thomas Blanton, titled "The World's Right to Know," from the July/August 2002 issue of Foreign Policy. 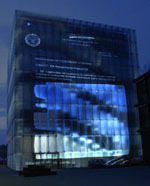 The texts appear in a series of projections, from 10 p.m. to 1 a.m. each night between June 11 and June 18, onto such surfaces as the façade of the Kunsthaus Bregenz, the Rhomberg rock quarry, the Vermunt reservoir dam, and the "West Side Story" floating stage on Lake Constance. In addition, the top three floors of the Kunsthaus feature Holzer's electronic sign arrays as they stream extracts of the texts. "Jenny Holzer does for the digital age what a nail and broadsheet used to do, for example when Martin Luther pounded his theses onto the church door," commented Thomas Blanton, the Archive's director. "She turns every surface into a page, she illuminates not only texts but perception, and by projecting these secrets into the night she transforms the words of power into transitory bolts of lightning."